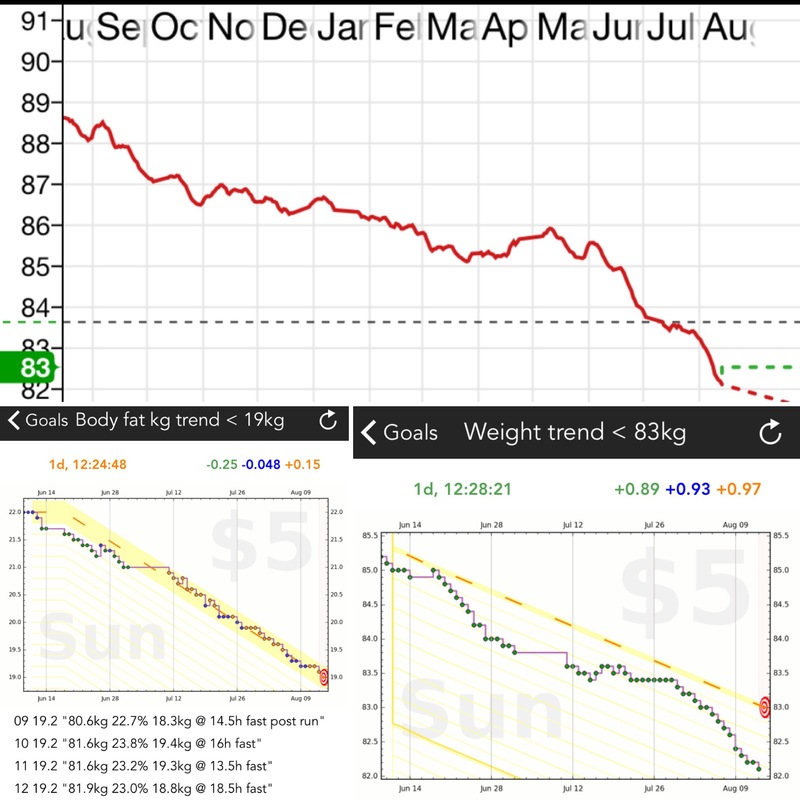 Top part: weight chart of the last 12 months (the bet started on June 10). Bottom left: trend of body fat in kg calculated by FatWatch. Bottom right: trend of total weight in kg. Graphs by Beeminder. Nine weeks ago, a friend set out to get back into a more fit state and asked people to publicly bet against him. I ended up joining with a bet of my own. Specific goals were set on losing overall weight but also fat, along with the commitment to post regular updates. Here is the final update (previous updates in my FB profile )! Numbers first: Weight part of the bet has long be won. Starting at a 85.1kg weight trend in June 10, I’m now at 82.1kg, well below the 83kg target. As for the fat part, starting at 22.0kg ended at 19.1kg, slightly off from the 19kg target. So, technically I lost the bet as I didn’t match all goals. In more practical terms, I set out to gain 1kg of muscle while losing 3kg of fat. The outcome (with whatever accuracy my scale has) was too lose almost 3kg of fat with no muscle gain. Given that losing muscle is very common when dieting, I’m quite happy with the results (assuming that I had put realistic goals in the first place). Also, as shown in the yearly graph above, I’ve highly accelerated the rate of weight loss versus the previous 10 months. b) Public goals are easier: in the same manner, doing weekly public updates forces short-period checks towards one’s progress. This isn’t the same as looking at a chart of data points. Taking the time to think and write about it, means you actually have to be more self-aware of what exactly you’re doing. c) (More importantly) Success is in the input: the output will be affected by many things that you won’t always control. Even if the stated goal is about the output (losing weight), the real goal is to develop a plan and implement it. After all, there’s always another two months to adjust and try for a new goal. Round 2 starts next week. P.S. Tools involved for the tracking: FatWatch (iOS) for weight logging and calculating the weight and fat trends using the Hacker’s Diet formula. Beeminder for charting the goals and monitoring progress, making sure I’m on the right path. This entry was posted on Monday, August 15th, 2016 at 8:22 pm	and is filed under Productivity.